The Foundation of the Sacred Stream is a non-profit organization dedicated to bringing the wisdom of ancient healing and spiritual traditions into the consciousness of those interested in being of service in the world. We offer a variety of workshops and trainings and provide a home to many guest teachers and artists from different traditions. The Sacred Stream Center is located in Berkeley California. 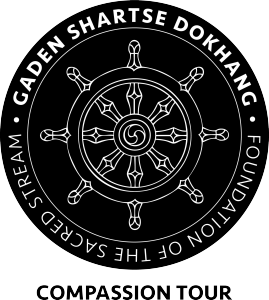 We are excited to team up with the monks of the Gaden Shartse Dokhang Monastery to assist them in their very worthwhile endeavor to share their culture and wisdom in the west. The funds raised from the tour will go towards the restoration of their monastery and preservation of their ancient traditions. It is a critical time in Tibetan history, and we feel it is our duty as citizens of the world to help the people of Tibet preserve their texts, traditions, practices and culture. The gifts that the monks and Tibetan people have to offer are extensive and in part contained in the intention of the tour – to cultivate compassionate consciousness and peace in the world.